This was a simple pizza crust that did not rise much but was okay. It was not tough and so was a good basic dough recipe. Dylan liked it but Sidney would not try it. I brushed the crust ends with olive oil and sprinkled them with garlic salt which really enhanced the flavor. I would give it a three star rating because it was simple and did the trick but I’d like to find a recipe that I love! For the sauce I used a purchased pizza sauce by Contadina. For toppings we used black olives, diced Cherub tomatoes, 1/4″ sliced ham, chopped green onions and freshly shaved mozzarella cheese. 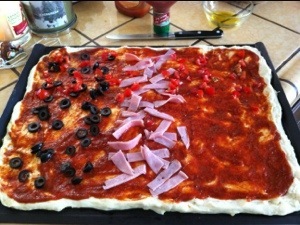 I got this recipe from All Recipes.com Valentino Pizza Crust. This entry was posted in Recipes and tagged pizza. Bookmark the permalink.